A Twelfth Cake as not seen on TV! Recently I have watched a lot on British television (and heard even more on the radio) about Twelfth Night, the so-called last day of Christmas. But according to the liturgical calendar, the ecclesiastical season of Christmas doesn't actually end until Candlemas, the 2nd of February, a celebratory period of not twelve, but forty days. So with this in mind, and the fact that it is the 8th of January today, I guess it is still not too late for me to wish you all a Merry Christmas and apologise for my lack of communication this past year. That's my excuse anyway! Wilkinson and his neighbours were so superstitious that they believed that the oxen and other animals in the byres and stalls all genuflected on Christmas Eve when the clock struck twelve! 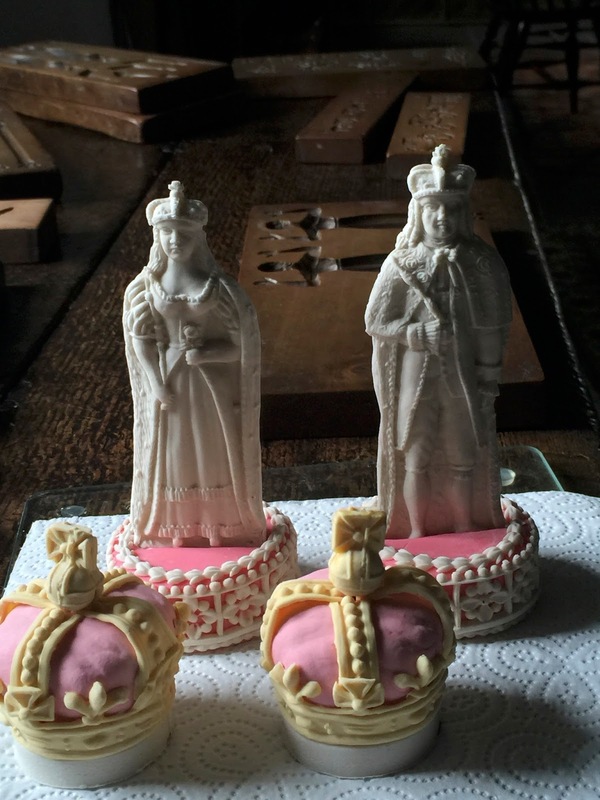 Detail of a Twelfth Cake mould signed by James Gunter. Anyway, back to the British television programme I hinted at earlier, which featured Twelfth Day celebrations. It was a fun Christmas edition of a production called The Victorian Bakers. It, like the original three-part version screened last year, was full of interesting facts about professional bakers in the nineteenth century. But for me it held one terrible disappointment - the quality of the food that the bakers produced. If you watched the programme, please do not believe that what you saw was really anything like the food of the nineteenth century. I sometimes had to hold my hands over my eyes and frequently wanted to roll my sleeves up to show them how to do it properly. However. this was not the fault of the bakers themselves, who were all modern professionals with incredible contemporary skills. I guess the TV company wanted them to 'bring the period back to life' through discovering the difficulties and making lots of mistakes on the way. The whole thing reminded me a bit of a food history series from a number of years ago called Supersizers. I was the "historical advisor" to that series, but the producers rarely took my advice. And although the series was highly entertaining, the food cooked by modern culinary professionals was absolutely awful, with an emphasis on offal, cods head and other dishes chosen for their shock value. 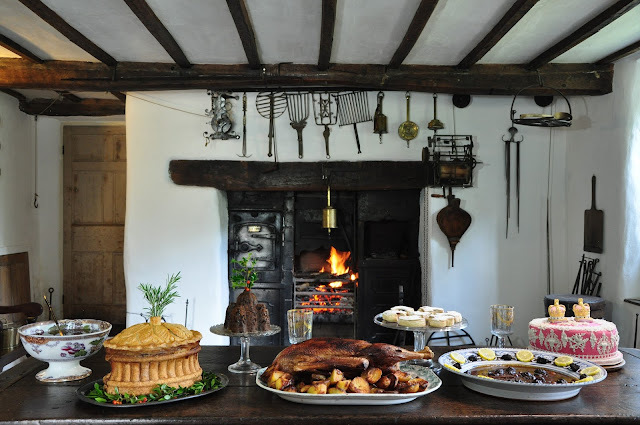 As is the wont of these 'living history' productions, the Victorian Bakers also featured lashings of tripe, tongue etc. to shock our modern squeamish sensibilities (yawn!). But what was missing were the incredible skills (now mainly lost) that Victorian bakers and confectioners possessed. I prefer to celebrate those. However, I have a confession to make. The makers of the programme did ask me to teach the bakers to decorate some twelfth cakes, but the scene we eventually filmed was not used in the final cut. I was asked to make and decorate a twelfth cake to show them the skill level, but also to teach two of the bakers to decorate one themselves. We had a great day and I think they learnt quite a lot. But what made the session very special was that I let them have a go at using some of my precious confectioner's moulds to make their cake really true to period. In fact we used moulds carved by the greatest twelfth cake decorator of all, the London based Italian confectioner William Jarrin, which was I suppose a bit like letting a modern art student use Rembrandt's actual paintbrushes. As you can see, the king and queen mould above came from the celebrated confectionery shop belonging to the Gunter family, for whom Jarrin worked as an ornament maker for a few years after the battle of Waterloo, In later life, Jarrin was paid by Lord Mansfield to travel from London to Scone Palace in Scotland to decorate a special shortbread for a visit of Queen Victoria. That always seems a bit bizarre to me - an Italian confectioner going to Scotland to decorate a shortbread! 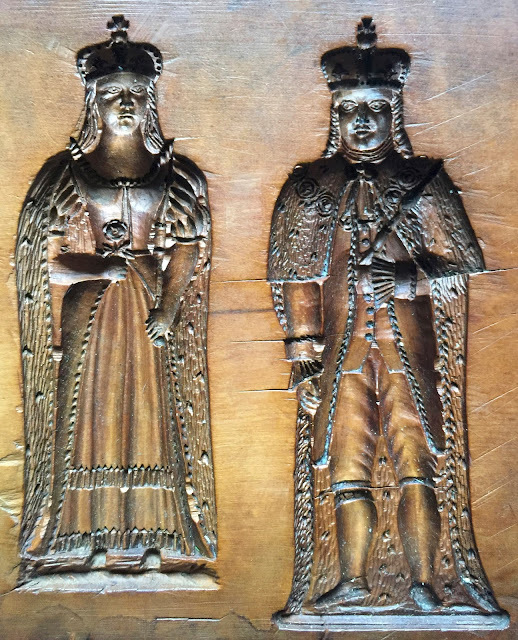 For me, it is an incredible privilege to own and to be able to use moulds carved by this nineteenth century master. I wish the BBC had also appreciated this. Anyway, to return to the Victorian Bakers. I was commissioned by the production company to make the cake at the top of this page with its neo-gothic gum-paste decorations, while the two bakers had a go at ornamenting the one below, using some of Jarrin's moulds. 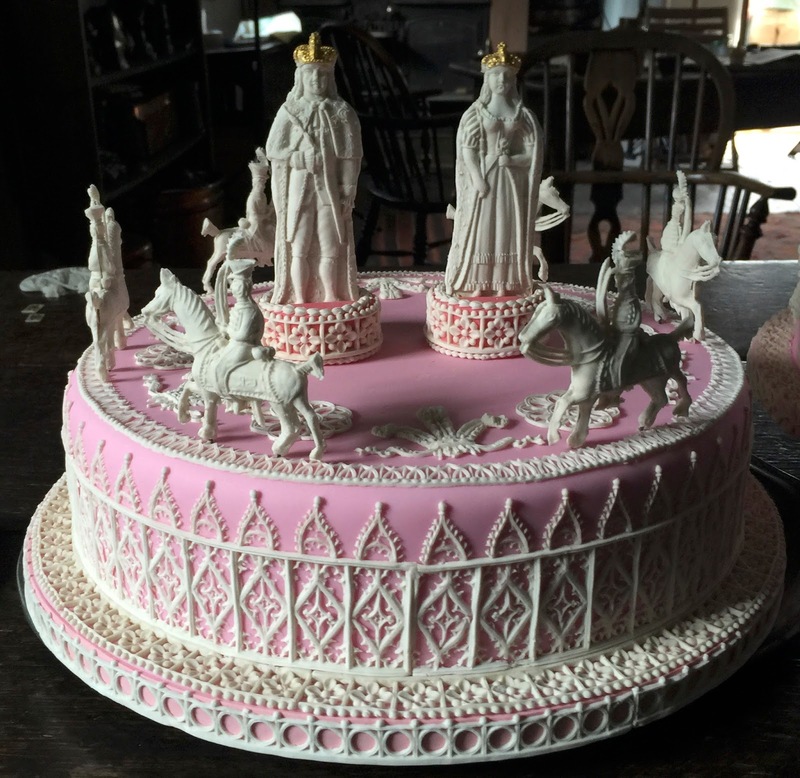 Harpreet Baura-Singh, who makes high-class contemporary cakes for a living, particularly took to the challenging task of pressing gum paste from these extraordinary moulds. 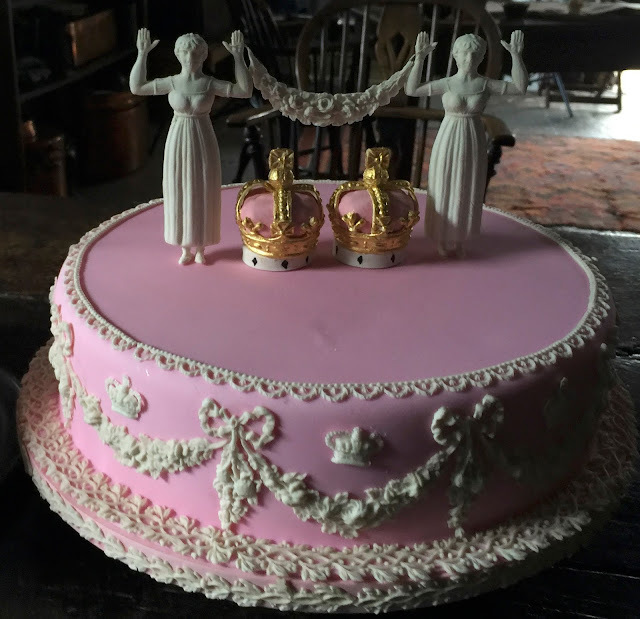 Both cakes were iced with a base of pink cochineal icing as per the instructions of a number of the early authorities. The other baker, John Foster confessed that he would rather have spent his time with me making some traditional pies. Some of the other bakers did have a go at making a pie on the programme - a gargantuan Yorkshire Christmas Pie, very loosely based on a recipe in Francatelli. But the less I say about how it turned out, the better - though I suspect Mr Francatelli may be rotating rapidly in his grave. And I am not going to say too much either about the gingerbreads and moulded Christmas pudding, which would have worked much better if the bakers had been taught to use the kit properly. 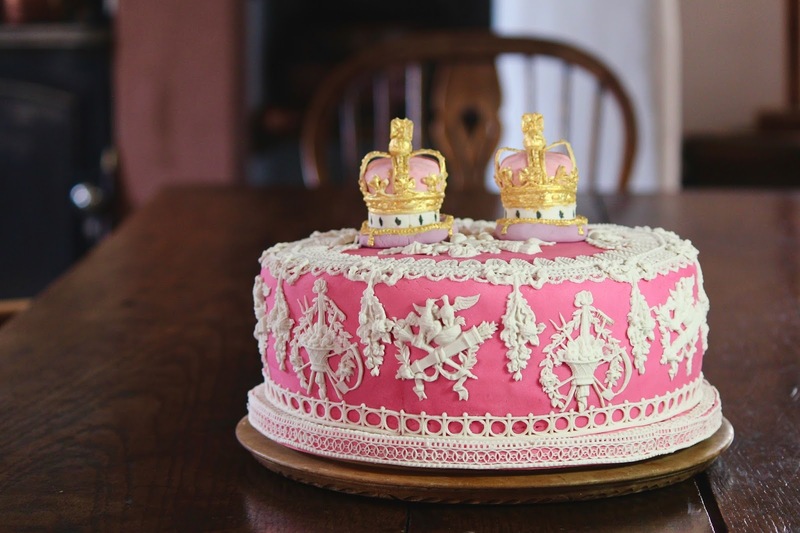 Anyway, this is what the twelfth cakes looked like, because sadly they did not make it to the final edit. A much more satisfying pre-Christmas project was a feature I worked on on the subject of English Christmas traditions for the popular Japanese magazine RSVP. This was written by Kirstie Sobue with some stunning photos of the dishes by her husband Hideyuki. The article was eighteen pages long and profusely illustrated. Here is a selection of the dishes below, which as you can see did include another twelfth cake specially made for the feature.Another memorable and fun moment at the tailend of my year was feeding Edward Stourton a bowl of plum potage for the Radio 4 programme Sunday, which was broadcast on Christmas morning. When Edward saw the dark brown mess before him, he did not look impressed, but after tasting it declared that it was delicious. I have put one of Hideyuki's photos of the potage at the end of this post. I hope you all enjoy the twenty-five remaining days of Christmas. I will actually be in Detroit on Candlemas Day to give a couple of workshops and a public lecture at the wonderful exhibition The Edible Monument, so if any of you are there and are feeling hungry, I will share a piece of my forty-day-old sweet pie with you, that is if immigration allow me to bring it into the US. Merry Christmas! This lucky slice contained the bean, so he who gets the bean gets the crown. Merry Christmas to you also Ivan. A post from you is truly a wonderful Christmas gift. Hope to hear more from you in the New Year. Merry Christmas and Happy New Year! Delightful creations. They look delicious. 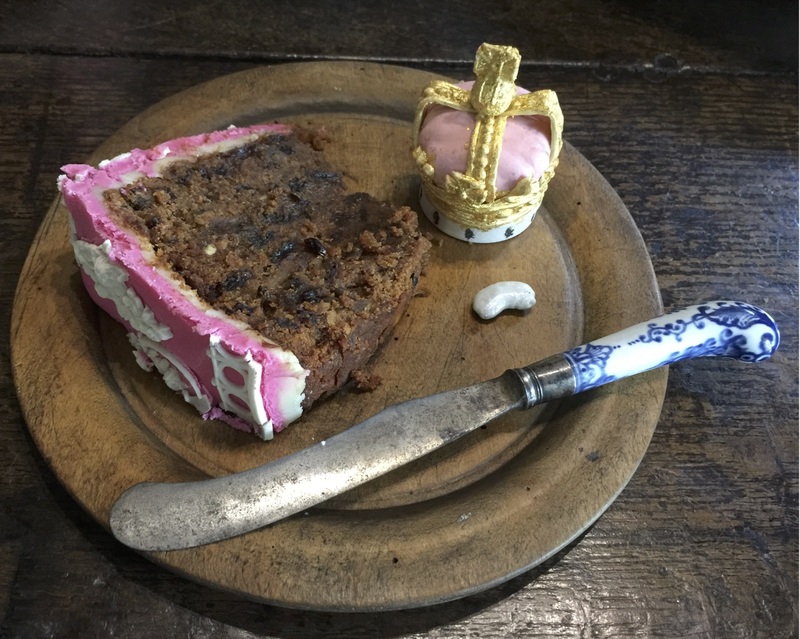 Delightfully interesting post - gorgeous cakes, and may I now keep my fairy lights on til Feb 2nd also :) Merry, merry! Sincerely looking forward to your lecture on February 4 at the Detroit Institute of Arts. It will be a great pleasure. And Merry Christmas to you!! P.S. Would love a piece a piece of the sweet pie but very much doubt immigration will allow it in. Welcome back to the blog! You have been missed. 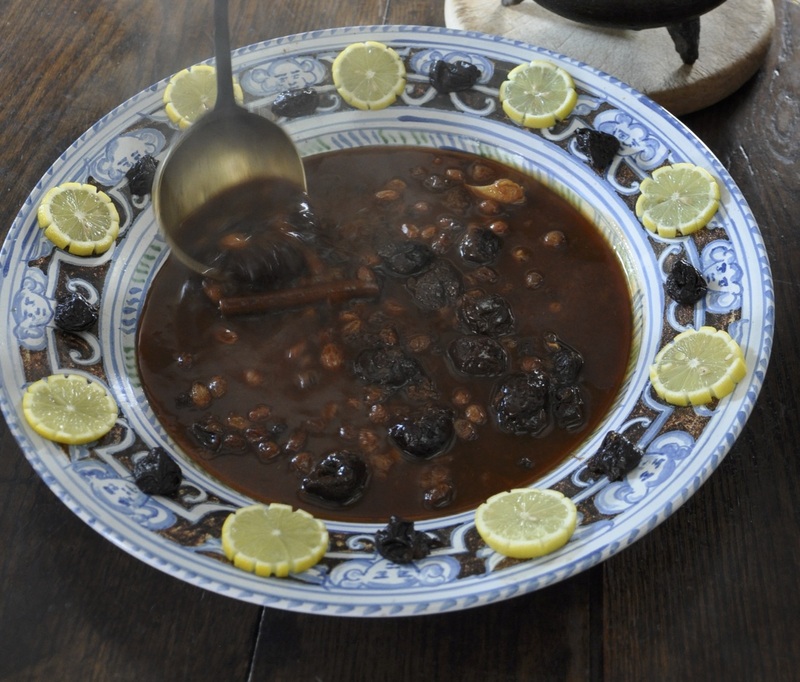 The plum potage was particularly interesting because that dish was mentioned in the recent MOOC, "History of Royal Food and Feasting". People didn't know what it was and couldn't find recipes at first. The photo you presented above was much more edible-looking than what some came up with. For some reason, the blog seems to be adding comments twice. Christmas gremlins? Happy New Year to you, Ivan! So nice to get this post...it's been a long time. Would love to hear from you more often. Always interesting and inspirational. Thanks.